Thomas Wright Thompson was born January 6, 1927 in Jersey City and grew up in Woodbridge. Bright and athletic, he was a star at Woodbridge High School for football coach Nick Priscoe. Tommy played center on offense for the Barrons and was a lineman on defense. He continued as a two-way player for William & Mary, earning a reputation as a hard-hitting linebacker. Because of the manpower shortages created by World War II, Tommy was allowed to play varsity ball for the Lions as a freshman in 1944. He spent the next year in the military but returned to campus and played from 1946 to 1948. Tommy stood 6’2” and weighed 215 pounds. His combination of size and speed produced blocks and tackles that were noteworthy for the ferocity. Coach Rube McCoy sometimes held Tommy out of practice, fearing he would injure his teammates. Tommy was named All-Southern Conference as a center three times and was a third-team All-American at linebacker as a senior in 1948. He led William & Mary to the Southern Conference title in 1947 and, in 1948, to victory over Oklahoma State in the Delta Bowl. By this time he had already been drafted by the “local’ NFL team, the Washington Redskins. However, Tommy had other ideas. In the All-America Football Conference, Paul Brown’s Cleveland Browns were employing a 5–3 defense that created a position that was perfect for his skills—middle linebacker. Tommy signed with the Browns and helped them win the AAFC championship as a rookie. The AAFC folded after 1949 and the Browns entered the National Football League. With Tommy at middle linebacker, Cleveland won the NFL crown. His interception against the Rams in the 1950 title game was a key moment in the Browns’ 30–28 win. Coach Brown switched to a 5–2 defense in 1951, moving Tommy to the right outside linebacker positions, where he found himself in pass coverage on occasion. He responded to his new duties with 2 interceptions. He also recovered 4 fumbles that season and was named second-team All-Pro. 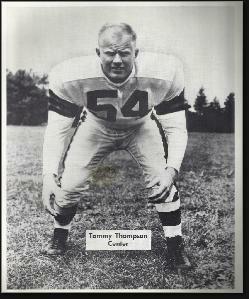 Tommy repeated as a second-team All-Pro in 1952 and was first-team in 1953. The Browns won the NFL East each year from 1951 to 1953, but fell in the championship game. 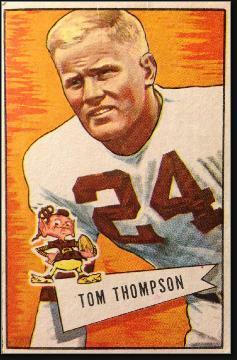 Tommy captained the Cleveland defense in 1952 and 1953. His reputation for hard tackles only grew as he crashed into NFL ball carriers. Tommy was equally effective meeting runners head-on up the middle, or chasing them down before they could turn the corner. One of Tommy’s great regrets was missing the 1953 championship game, a 17–16 loss to the Detroit Lions. The following summer, Tommy suffered another serious injury in training camp, which convinced him it was time to retire. At age 26, he informed Paul Brown that he was through. After football, Tommy went to work in the financial services industry and rose to the position of vice president. For many years he ran the Baltimore office of Shearson Lehman. Tommy was enshrined in the Virginia Hall of Fame and William & Mary Hall of Fame, and also served on the board of his alma mater. He passed away at 63 in 1990 after a battle with cancer.